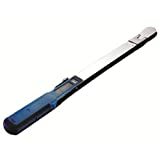 If you are a DIY kind of a person and love working on your car instead of depending on a professional mechanic for their service, then it is a good idea to invest in a high-quality torque wrench. A torque wrench is a must have tool in every handyman’s toolkit. So, what is a torque wrench really? A torque wrench is basically a socket wrench with a distinct internal mechanism that you use to apply a particular amount of torque and is mostly used by auto mechanics and other professionals to loosen and tighten bolts very quickly. Most of the torque wrenches available today feature a ratchet mechanism which allows the wrench to remain on the fastener. The click torque wrench is essentially a more sophisticated form of a socket wrench. You can preset the torque level by making use of the clutch mechanism. When you reach the desired torque, the clutch starts clipping out automatically and the shut-off mechanism stops it from going any further. The high-precision design of the click wrench prevents the wrench from crossing its breaking point. The beam torque wrench is the most basic and the simplest kind of wrench. The head and the handle of the wrench are separated by means of a lever arm. The arm has some elasticity and lets the wrench bend so that the required amount of pressure can be applied. The arm moves against a scale or a gauge that indicates the amount of torque being applied. Beam torque wrenches are quite heavy as they are manual and are also bulky to use compared to the other types of wrenches. Also known as digital torque wrenches, electronic wrenches are connected to an electric motor and multiply torque. These wrenches can be programmed and can be set for any limit you require according to the specific application. Once the desired torque is reached, you get an audible alert and the reading is displayed on the LED screen. Electronic torque wrenches come with a chip to save your torque readings and you can upload or access the readings via your computer using spreadsheets or documents. Hydraulic wrenches are designed to exert the desired amount of torque to fasteners. Sufficient pressure is applied to the bolt or nut head along with proper lubrication and the bolt or nut is tightened to a preset torque level. Hydraulic torque wrenches can be used for exerting a high amount of pressure and power and are mainly used for automotive applications. The plumber’s torque wrench is designed for use on soil pipes with couplings. 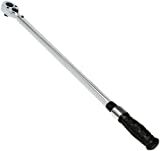 The plumber’s torque wrench is similar to the ratchet wrench but features a T-shaped handle. The wrench is pre-calibrated to slip out when the preset desired torque level is reached. However, before you set out to shop for your torque wrench, here are a few things you should consider first. You must select a torque wrench that is of a correct size. For instance, if you’re working on a large truck, you will need a large torque wrench, whereas if you’re working on a car or a motorcycle, a smaller torque wrench will be more appropriate. Usually, the accuracy of different torque wrenches vary; however, good quality wrenches offer an accuracy of more than 5%. Usually, a high-quality torque wrench comes along with a calibration certificate with the details of the accuracy and date mentioned. Torque wrenches need to be occasionally re-calibrated according to the maintenance schedule of the tool to maintain accuracy. Also, in the case you drop the wrench, you must have it calibrated to verify the tool’s accuracy. A very important feature in a torque wrench is the grip. Look for one that offers good grip and is comfortable to handle and that will not slip when your hands are wet or covered with oil or engine fluid. Avoid buying a torque wrench that does not have a good grip as this will affect the efficiency of your work. 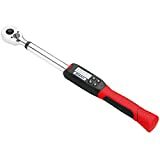 Look for torque wrenches with ratcheting as this offers a lot of conveniences especially if it is bi-directional for fasteners that have left-handed, as well as right-handed threads. Most of the electronic and click torque wrenches have ratcheting, while the beam torque wrenches do not have this feature. Look for a torque wrench that is made of high-quality materials. Buying a cheap wrench may not be a good idea as these usually contain a lot of plastic components which will wear out in a short period of time. Metal construction torque wrenches are a better bet as they are more durable and long-lasting. The torque wrench must be stored properly as per the recommendations of the manufacturer, as not storing it properly can affect its accuracy. It is better to keep the torque wrench in a hard plastic case as your tool will be protected better, as storing them in soft cases can cause them to get banged up and distort the calibration. Look for a torque wrench that offers an accurate measurement system such as Newton-meters or foot-pounds. 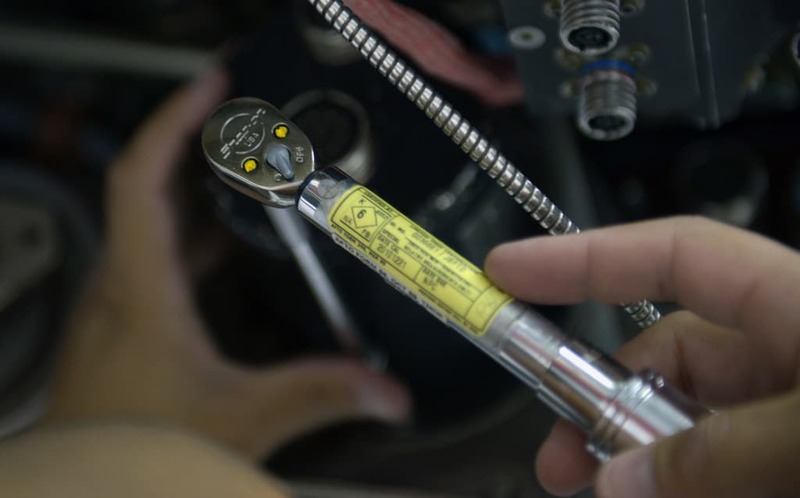 The torque wrench may also offer additional features such as a digital, LED display, etc. Look for a wrench that is easy to read and which you can adjust easily. Also, look for a torque wrench that offers a high-quality and good finish, as this affects the durability of the tool. When buying a torque wrench, look for a product that offers a warranty of at least a year. Reputed brands may offer longer period warranties. Tools with manufacturers’ warranties are usually good quality and durable and will give you peace of mind while buying it in case of any manufacturing defects, damage, etc. The Tekton 24340 Click Torque Wrench offers lots of features, excellent accuracy and precision. The torque wrench is user-friendly and functional. Although the tool is quite compact, it offers an excellent range and is suitable for mechanics working on various automobiles including cars and trucks. The torque wrench is quite lightweight weighing around 6.5 lbs, which makes it very easy to handle. Working on lug bolts, suspensions or replacing brakes is super easy with the Tekton 24340. The torque wrench is equipped with a bi-directional ratcheting head and once the desired torque is reached, an audible click will alert you to stop tightening. The Tekton torque wrench can be calibrated to offer accuracy of +/- 4% and prevents over-tightening of the fasteners as it eliminates any guesswork. The wrench allows you to tighten the fasteners of your machinery or vehicles as per the manufacturer’s specifications. The durable all-steel construction of the torque wrench makes it long-lasting. Dual range, high-contrast scale allows you to see the display very clearly. Versatile and works with various bolts and nuts. Well balanced and comfortable to handle. May not work very effectively when torque settings are higher. Carry case is quite flimsy. The torque wrench is very durable and can stand plenty of wear. Offering very good accuracy, the Tekton 24340 torque wrench is a very versatile tool which works in both directions and its reasonable price makes it a great buy that is easy on your pocket. The Snap-On CDI torque wrench is a micrometer torque wrench that is adjustable and is equipped with a dual scale which is calibrated and lets you get readings in both directions. The CDI torque wrench gives you accurate and precise readings every time. The scales of the wrench are calibrated using laser that allows for easy reading. The wrench also has a spring-loaded pull-down locking ring with a positive lock. The wrench is easy to set up and use because of the quick-release button. The convenient buttons and the ergonomic grip makes the tool very comfortable to handle. The CDI is an “all-round tool” which is best for engine, oil drain and suspension work. Does not have a click sound alert when you reach the required torque. Offering a wide torque range of 30-250 ft.lb., the CDI torque wrench is a very versatile and an excellent easy-to-use tool. It is suitable for use by people of varied skill levels. So, whether you are a professional or a DIYer, the CDI torque wrench is a great tool to have in your toolkit. If you want a convenient and accurate torque wrench without all the fiddling around and manual adjustments to get the right torque setting, then the ACDelco Digital Torque Wrench is the one to go for. The ACDelco digital wrench is equipped with an LCD screen and has many buttons that allow you the option of selecting the required setting in foot-pound or Newton-meter. The digital wrench and the LCD screen makes it extremely easy to read the settings. When you crank the torque wrench, you can know the pressure at which the wrench is being cranked on the LCD screen. The torque range of the ACDelco torque wrench is ideal for small jobs as the torque capacity of the wrench is only from 4ft/lbs to 99ft/lbs. The torque wrench is compact at 17 inches and lightweight too weighing just around 4 lbs. The torque wrench runs on 4 AAA batteries and has an auto shut-off feature if it is not used for 60 seconds. Lightweight and compact torque wrench. LCD screen makes it very convenient to read the display. Allows you to see the torque applied in real-time. Needs four AAA batteries for operation. Overall, the compact, lightweight ACDelco torque wrench is a reliable and handy tool and can be used for various jobs ranging from day-to-day maintenance and repair work on your bike. Being digital makes the torque wrench quite accurate and convenient too, making it a great buy. With so many options of torque wrenches available in the market, the choice of the right one can be rather confusing. We hope that after reading our buying guide and review, you are able to make an informed choice of the torque wrench that is best for all your requirements.